Lindblad Expeditions has now joined Aurora Expeditions in ordering a new 138-berth X-Bow expedition ship in Norway. The similar Aurora ship is being built in China. Elsewhere, current ferry builder Guangzhou Shipyard has exhibited a new design for a mid-sized cruise ship at the China Cruise Shipping event in Sanya last week and Carnival Cruise Line and Shell have announced an agreement for LNG bunker barge fuelling of two new ships in order for Carnival Cruise Line. Virgin Voyages trio of 2,860-berth “Lady ships” will feature silver-grey hulls with red accents. 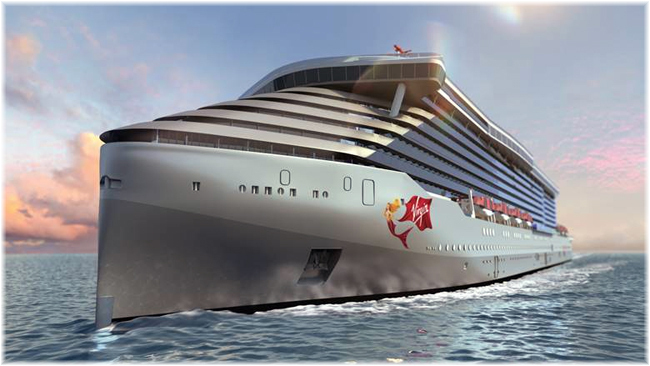 Last Tuesday in Genoa, Virgin Voyages unveiled more details of its trio of 110,000-ton 2,860-berth new generation cruise ships. The most important announcement was that to the relief of many they will be adult ships. No waterslides, no bumper cars, no cartoon characters and no one else’s children. Still in the adult world, Coral Expeditions has announced its opening itineraries for its 120-berth Coral Adventurer, due out in 2019. And guest writer Shawn Dake from Long Beach tells us how the Queen Mary in Long Beach, which still accommodates regular guests, is getting a long overdue lick of paint after fifty years in Long Beach..